Review Summary: THE STONEMAN MURDERS is an engrossing fare that would appeal more to the multiplex junta of big centres. The title is ominous; the promos more so. 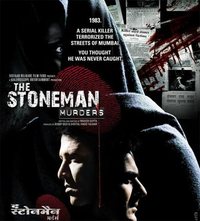 THE STONEMAN MURDERS is an engrossing fare that would appeal more to the multiplex junta of big centres. Set against the serial killings that terrorised the pavement dwellers of Mumbai in 1983 the film is a neat little thriller which actually keeps you glued to your seats. Worth Watching for the decent efforts.